Elements Applied: Root is the main plant’s element applied in herbal medicine. Active Components: Due to high glycoside percentage the plant is known to be a potent remedy for nervous conditions. Used For: American Ginseng produces a positive effect on the digestive system, acts as a soothing remedy for the nervous system, energizes the body and is also used as a universal remedy. Ginseng’s main capacity consists in eliminating tiredness, energizing the organism and producing a stimulative effect. The plant is successfully applied for any case which is linked with nervous system instability. Also used to eliminate sickness and vomiting, as well as applied to treat digestive system conditions. Indian peoples applied the plant to increase libido. Nowadays it’ also used to boost sexual desire. Additional Info: The plant has a long lifespan. Its height comprises 15 inches on average. The stem is erect, with complex leaves growing from its top. Small flowers blossom in summer, for two months. Red-colored berries can be seen at the end of summer. Thick root is a potent part of the plant. It takes about 5 years for the root to reach the size which is applicable in medicine. The plant has been treated as a remedy for all diseases for a long time. Preparation: Ginseng is applied in dry form; in this case it’s used for chewing. Applied when necessary. 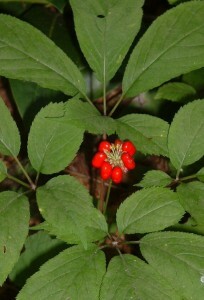 Ginseng powder is used for tea preparation.